Do you use Office 365 on a Mac? Then you’ll be happy to learn that Microsoft recently released Office for Mac 2016 and it’s available free for Office 365 customers! (That is, for subscribers with full installed Office applications.) Office 365 automatic updates ensure that you’ll always have the latest Word, Excel, PowerPoint, OneNote and Outlook features. By signing in with your Office identity, you’ll be able to access your files, stored on SharePoint or OneDrive, both on your Mac in the office and on your mobile device while on the go! The changes you make on the document on one device will show up when you return to another device and refresh the document. 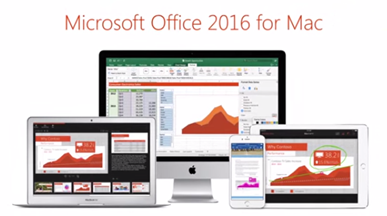 What’s new with this upgrade from Office 2011 to Office 2016? Some features that should be exciting for our clients include Co-Authoring in Word and PowerPoint, a “recent files” dropdown for the Outlook “attach” button, and a unified look and feel across all platforms. In addition, most keyboard shortcuts used on PCs using the Ctrl key will now work on Macs. Here’s a sampling of the new Office for Mac 2016 improvements that will help you to increase your business productivity and improve your image. Word has built-in tools to share and review documents, and several people can work on the same document simultaneously, using threaded comments to have a conversation about the changes. (The only limitation is that they can’t work on the same paragraph at the same time.) The Design tab provides quick access to design elements, and the new Insights pane shows relevant contextual information from the web. Excel enables you to turn numbers into insights. It recommends charts that are best suited for your numbers to help you visualize your data and it provides new PivotTable Slicers to help you discover patterns in large amounts of data. There’s also a print-to-PDF feature, improvements to autocomplete and a formula builder. PowerPoint has a new Presenter View which displays the current slide, next slide, speaker notes, and a timer on your Mac, while projecting only the presentation on the big screen for your audience. There’s also a new Animation pane to help you design animations. Coauthoring enables several people to work simultaneously on the same presentation and the Conflict Resolution view allows you to compare conflicting changes. OneNote allows you to capture, organize and share your ideas in digital notebooks that you can access on any device. A powerful search engine enables you to find things quickly by tracking your tags, indexing your typed notes, and recognizing text in images and handwritten notes. You can format your notes and easily share notebooks to work on notes together with colleagues. OneNote also provides the ability to record audio notes with both timestamps and text markers. Outlook has an improved conversation view that organizes your email inbox around threaded conversations, and a new message preview that shows the first sentence of an email. Push mail support keeps your inbox always up to date. To make space in your mailbox, you can move messages from your inbox to an Online Archive on the server which you can access from the navigation pane. The “attach” button even has a “recent files” dropdown to help you find the desired document more quickly! There’s also an option now to propose a new time in a meeting invite. Office for Mac 2016 is only available to Office 365 subscribers now, but it will be available for everyone else in September. In the meantime, our Big Idea Technology clients who use Macs will enjoy the new features!